The poor, the working class, and at last (surprise!) 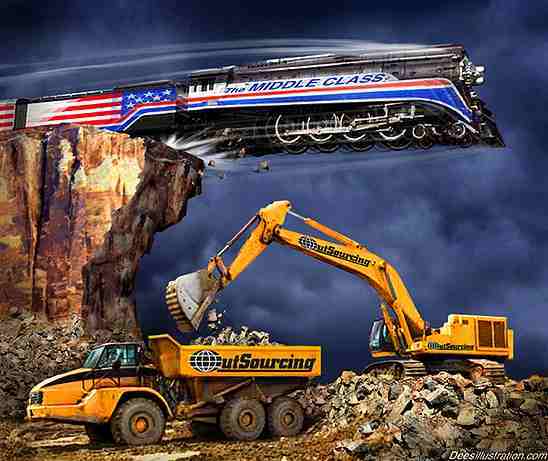 the middle class have all been shafted by the mainstream "liberal" institutions that once--to an extent--looked out for our interests. 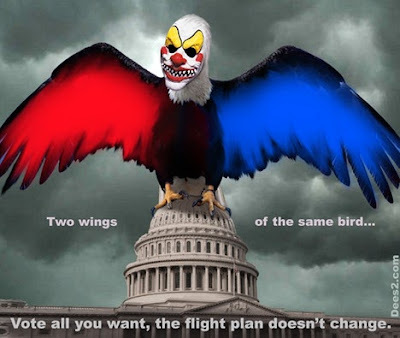 Journalist/prophet Chris Hedges identifies a half-dozen such institutions that have by now said, "If you can't beat 'em [the plutocrats], serve 'em!" To Hedges, the worst offenders are the liberal Christian Church, the media, and--worst of all--the Democratic Party. This program focuses on the Democratic Party. We'll hear parts of a fine talk by Hedges--on the Dems from Clinton onwards--and some ruminations by me. And we'll read aloud a nice essay by Philadelphia journalist Dave Lindorff. Lindorff focuses on the perfidy of the Obama administration in particular. Continuity we can believe in! Other audio included: the "I'm as mad as hell" rant by "Howard Beale" (from the movie Network) & 2 songs by Fred Eaglesmith. 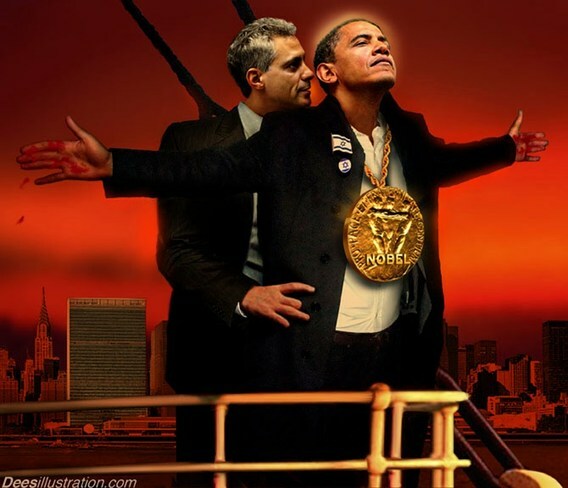 Top: Satan (former Chief of Staff Rahm Emanuel) tempting the President. This week's graphics (except Clinton photo) are by David Dees. Most graphics: Click to enlarge. Chris Hedges spoke on "The Death of the Liberal Class" at the Sanctuary for Independent Media, Troy, NY, October 15, 2010. Our audio of Hedges is taken from the video released by Sanctuary TV. New World Notes is produced under the auspices (Latin for "benign neglect") of WWUH-FM, a community service of that beacon of light in darkest Connecticut, the University of Hartford. You can listen to any installment of New World Notes online or else download it (as an mp3 audio file) for later listening. The show is archived at both radio4all.net and (from #90 onwards) The Internet Archive. Either link should get you a reverse-chrono listing of available installments. Or browse the show's Web site: Each installment has a page, and each page has links to the recorded audio. 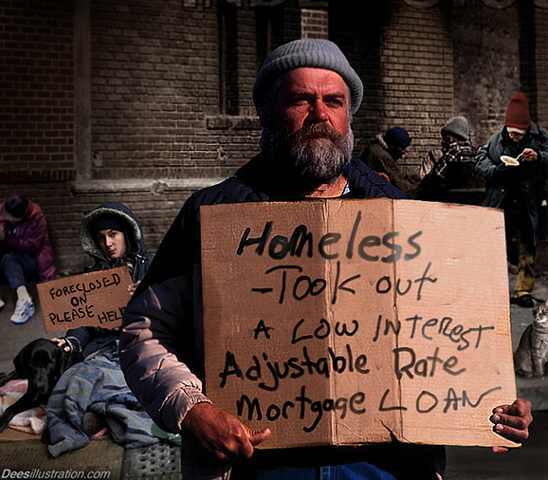 produced by the Democratic Party" (Chris Hedges). 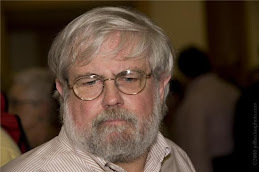 The inventors of the Internet (25 years later). 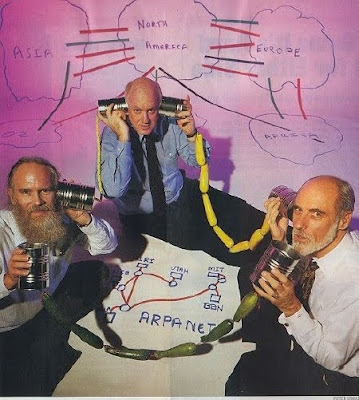 L to r: Jon Postel, Steve Crocker, Vint Cerf. A sharp & funny presentation by Internet Law expert Jonathan Zittrain. 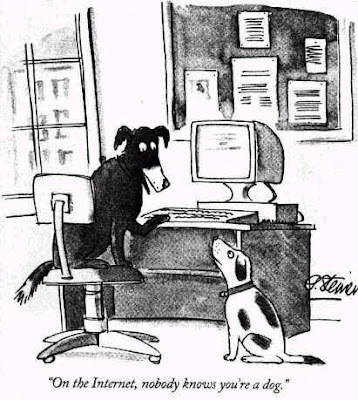 The more we depend on the Internet, the scarier is its very real vulnerability to malicious attacks. 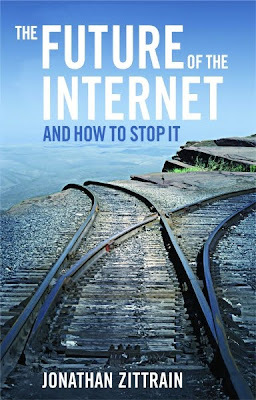 However, Zittrain argues, the "solution" urged by government and Big Telecom--"top-down" control of the network by themselves--would ruin the Internet. A better solution is continued "bottom-up" control by users--but control of a more "communitarian," consensus-seeking sort than is typical now. Examples of this approach are working well in practice, among them Wikipedia. Not to mention the time Pakistan kidnapped YouTube. A bunch of mid-level server operators--personally unknown to one another--joined together and rescued the site within a couple of hours. Zittrain spoke at The University of Hartford on October 20, 2010. This installment comprises selections from his long presentation. Recorded and edited by Kenneth Dowst. 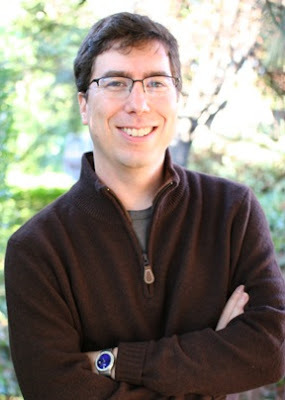 Jonathan Zittrain is Professor of Law at Harvard Law School. 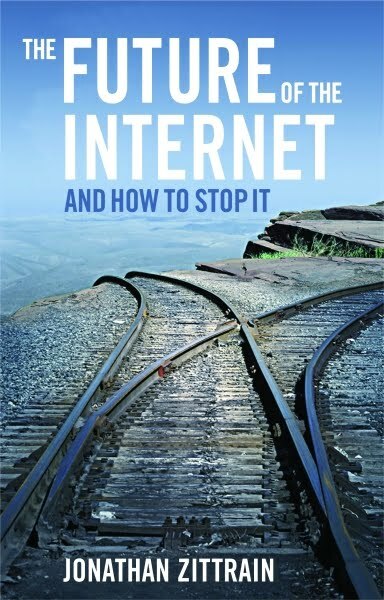 Zittrain's recent book, The Future of the Internet--And How to Stop It (Yale University Press, 2008) is available in print and also as a free download. New World Notes is produced under the auspices (Latin for "oppressive yoke") of WWUH-FM, a community service of that beacon of light in darkest Connecticut, the University of Hartford. secure. 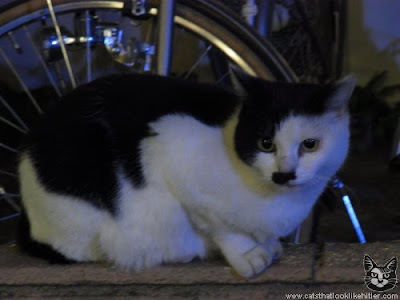 But would the world have http://www.catsthatlooklikehitler.com/? Not likely! Shown: "kitler" #5448. Historian/peace activist Jim Douglass shows how--and why--President Kennedy "turned" from a Cold Warrior into a crusader for military disarmament. Douglass focuses on the Cuban Missile Crisis of 1962, which nearly touched off a nuclear war with the Soviet Union--a war that the Pentagon and the CIA very much wanted. Douglass also discusses--and we'll hear major excerpts from--one of the results of the crisis, John F. Kennedy's great "Peace" speech at American University, June 10, 1963. This pair of shows was first broadcast in December 2008. Kennedy was murdered 47 years ago this month, on November 22, 1963. In the early 1960s almost the whole of the U.S. "national security state" (Pentagon, spy agencies, National Security Council) very much wanted war with the Soviet Union. We would win this nuclear war, they calculated, losing only 40 million lives, while the Soviet Union would lose perhaps 200 million and be destroyed. The U.S. would emerge as the world's sole superpower. In October 1962, the CIA discovered a Russian-controlled nuclear-capable missile base in Cuba. The war-hawks immediately began shrieking that we must bomb the base. 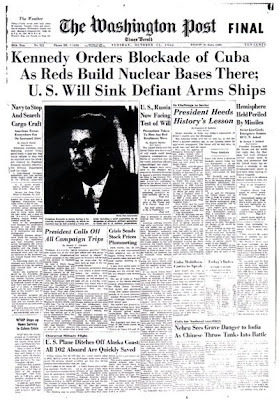 "Taking out" the base, they "reasoned," would have the additional good effect of starting the war with the Soviet Union that they so much wanted. Only one American of any influence opposed the war-hawks: President John F. Kennedy. As he was on the brink of failing to prevent World War III, he begged for help from his nominal adversary--and secret pen-pal--Soviet Premier Nikita S. Khrushchev. Khrushchev very publically dismantled the Soviet bases in Cuba. 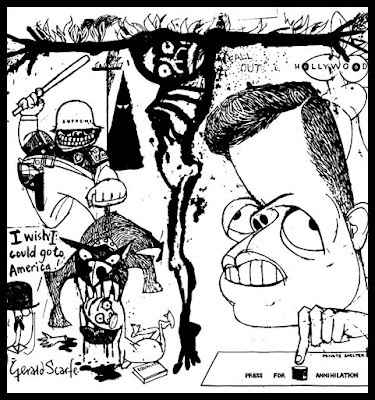 finger on The Button: Gerald Scarfe was having none of it. Afterwards, in a speech of June 10, 1963, Kennedy announced a bold reversal of U.S. policy. He announced military disarmament as desirable, attainable, and henceforth a policy goal of the U.S. Government. 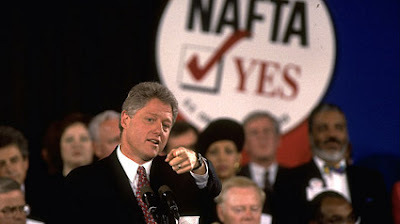 And he announced several steps in that direction, to be undertaken immediately, including the negotiation of a Nuclear Test-Ban Treaty with the Soviet Union. The speech essentially called for an end to "the Cold War." The Military-Industrial Complex was not amused. Few Americans have ever heard this amazing story. Or heard what Khruschchev called "the greatest speech by any American President since Roosevelt." These two installments alternate between Jim Douglass' fascinating telling of the story and the June 10 speech itself--Kennedy's commencement address at American University. PS: Within a year of Kennedy's great speech, the Powers That Be deposed Khrushchev and murdered Kennedy. Correction: In my new preface to NWN #140, I gave the date of Kennedy's great "Peace" speech at American University as June 10, 2003. In fact, the date was June 10, 1963. Douglass talk courtesy of Mike McCormick and Mind Over Matters. Douglass is the author of JFK and the Unspeakable: Why He Died and Why It Matters. 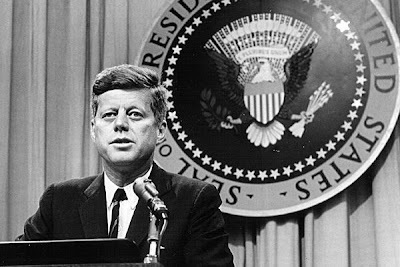 The audio of Kennedy's complete speech is available as a free download from The Internet Archive. For a brief, illustrated background-sketch of the geopolitical crises the Kennedy Administration had to face, please see my page, "The Story Behind the Greatest Speech You Never Heard." New World Notes is produced under the auspices (Latin for "bad influence") of WWUH-FM, a community service of that beacon of light in darkest Connecticut, the University of Hartford. Kennedy and Khrushchev. Cartoon by Herbert Block.